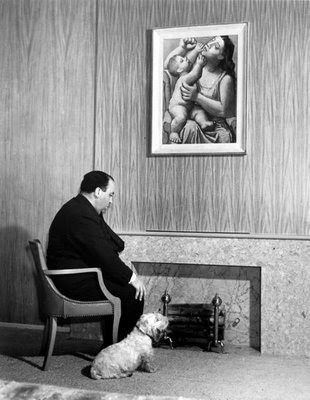 Hitchcock at home with Mr. Jenkins -- his Sealyham Terrier -- and a Picasso. He titled the portrait "A Dislike of American Fireplaces". Let me just say it. I love Alfred Hitchcock. As one of the most technically skilled film directors in history, he made movies that are, across the board, superbly-crafted screen gems. He was a hell of an entertainer and his work is always well worth the price of admission. But that isn’t why I love him. Blending Cockney wordplay with lowest-common-denominator bathroom jokes, Hitch sported a droll, often perverse sense of humor. I imagine that associates never knew what would come out of his mouth next. I’ll bet he would have kept me on my toes, had I known him personally. As much fun as that would have been, it’s not why I love him. And then there's the genius. He produced an enormous, consistently high-quality body of work that, projected through a lens of his own fabrication, epitomized the Zeitgeist of the twentieth century. For that reason, I envy Hitch a little – but it doesn’t move me to love him. To be sure, he had his share of character flaws. He could be obnoxious and mean-spirited, maybe even sociopathically so at times. He rarely offered compliments: praise from him came in the form of a paycheck and a phone call offering another employment opportunity. He wasn’t always likable, and that fact hardly makes me love him. The reason I love Hitch is simple. I feel as if I know him. And not just through the multitude of often unhelpful biographies I’ve read. I feel as if I know him because he revealed himself nakedly to anyone who would take a moment to really look. Such honesty, especially when it illuminated the dark corners of the heart that most of us would prefer to keep hidden is beautiful. This is what keeps me watching Hitchcock’s movies. This is what makes my geekism meaningful. Want to get to know the real Alfred Hitchcock? He’s hiding in plain sight, just beyond the Klieg lights and A-list movie stars. Finding him in his movies is like hunting wild mushrooms: you have to know what you’re looking for; but once you do, it seems he shows up everywhere. His famous cameo appearances are only the beginning. A good case in point is his 1946 masterpiece Notorious, a movie loaded with autobiographical details. In fact, the parallels between this film and his personal life at that time are so abundant that the film almost reads like a diary. In his first biography of the director, The Dark Side of Genius: The Life of Alfred Hitchcock, Donald Spoto wrote that the death of his mother, the apparently maternal relationship he had with his wife Alma and the crush he’d developed on Ingrid Bergman "all released a flood of conflicting feelings that made Notorious not only possible but necessary... [it was] the artistic rendition of an inner life that might have exploded if denied expression." Anyone who is willing to be that vulnerable in front of so large a crowd is okay in my book. In fact, it makes him a hero. At the end of the day, it also makes him lovable. Come back in a day or so and I'll show how Notorious made me love Hitchcock. Notorious: laced with arsenic and autobiography. You are a true Hitchcock fan sir. I love him too and Notorious is superb. Great post and I especially like the photo you included with the dog! Thanks for sharing.